Sunny Orange County, California isn’t just a travel destination. Whether you're a scientist or a screenwriter, Chapman University’s close proximity to industry leaders will propel you and jumpstart your career. Drawing on the entrepreneurial spirit of the West Coast, our proximity to Los Angeles helps our students land internships, job prospects and other opportunities with industry leading organizations. And to top it all off, Orange County is consistently featured as one of the most visited places in the country. Enjoy world famous theme parks like Disneyland and Knott’s Berry Farm, or visit beautiful beaches just 20 minutes away from campus. Just a short stroll away, Old Towne is a delightfully charming area with beautifully restored historic homes. If you like history, dining, antiques shopping, malls or cultural attractions, visit this beautiful city, known as a “major city with small-town ambiance.” Old Towne Orange is also a hot spot for filming movies and television shows. 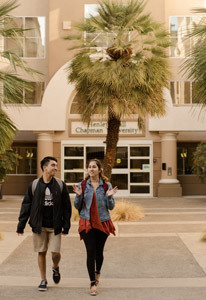 The City of Irvine is not just the home of our Rinker Campus — it's also one of the nation's largest planned urban communities — and one of the safest. It enjoys a vibrant business environment and is known for its education system. Irvine contains several "villages," each initially planned to have distinct architectural theming. Even if you haven’t heard of the Ducks (hockey) or the Angels (baseball), you probably know of Anaheim by the world’s most famous mouse, Mickey. Home to Disneyland Resort and the county’s professional sports teams, this city was first made famous by its wine grapes in the 1800s. Anaheim is also the 10th most populous city in California. Also known as “Surf City,” Huntington Beach is known for its mild climate and the fact that it hosts the US Open of Surfing — and countless other surfing events — each year, attracting some of the top surfers from around the world. Huntington Beach is also known for hiking and wildlife viewing at the Bolsa Chica Ecological Reserve. While you’re here, be sure to check out the pier, which stretches more than 1,800 feet into the ocean. This city gained a reputation as a beachfront resort over a hundred years ago. In the 1900s, the community became known for being one of the county’s biggest art colonies. And if 75 art galleries isn't enough, you can always explore the breathtaking views of the town's green hills and beautiful beaches. Both the largest and most populous city in Orange County, Santa Ana boasts not just the financial and governmental center of Orange County, but also a revitalized downtown area complete with a museum and art center. Santa Ana also contains retail, housing, the Santa Ana Civic Center, the Ronald Reagan Federal Building and a historic courthouse you may have seen on American Horror Story. With so much to do in Southern California, why not hop on a train and visit somewhere nearby? Los Angeles is the cultural, financial and commercial center of Southern California. Known for its diversity and for being one of the largest economies of the nation, Los Angeles is famous for Hollywood, one of the world's largest entertainment industry centers. The eighth-largest city in the U.S., San Diego is sometimes referred to as "the birthplace of California." Heavily influenced by both American and Mexican culture, this border town includes many historical attractions, as well as a thriving musical and theatrical scene. Oh, and there's always the San Diego Zoo — frequently cited as one of the best zoos in the world. Orange County is the 12th largest economy in the U.S.